Today's guest was named a 2015 South Carolina Young Entrepreneur of the Year (the youngest to ever receive this award) and the 2018 Black Enterprise Teenpreneur of the Year. She has received national press coverage through television shows like The Real and The Today Show, and publications like the Washington Post, Essence.com, and Madamnoire. Alongside her mom, Rozalynn, she has solved the age-old problem of disappearing hair barrettes by inventing the first and patented Double-Face Double-Snap Barrette. Her company has filled orders to all 50 states in the U.S. and in ten countries. I am excited to introduce you to the CEO of GaBBY Bows, Gabby Goodwin! Gabby shares what she remembers about the early stages of GaBBY Bows. Gabby started her business when she was 7 years old. It started with the desire to solve the problem of losing barrettes. She knows her self-confidence has grown significantly over the past 5 years. She was able to overcome her fear of public speaking by gaining so much experience. Gabby’s mom Rozalynn shares about her business experience. They are 1st generation FamilyPreneurs! At the moment, Rozalynn still has her full time job in healthcare policy and administration, but maybe not for long! Rozalynn shares how they identified how to get this business running. She knew right away they wouldn’t be able to make the barrette themselves because they wanted it to be plastic. They started with a sketch and then had an artist create a 3D rendering of their idea. They were then able to submit the rendering to the engineers who created a prototype who then connected them with manufacturers. Gabby explains what makes this barrettes unique. These barrettes have 2 faces as well as teeth and craters that trap the hair and they don’t fall out of the hair. The key is to the barrette is the two faces. Gabby explains how she has been involved in the business. She was initially in charge of coming up with new designs. Then she moved into sending hand written notes to every customer. Now she is the face of the business and does a lot of public speaking. She’s involved in every aspect of the business, but Rozalynn is careful to protect her in the world of social media. 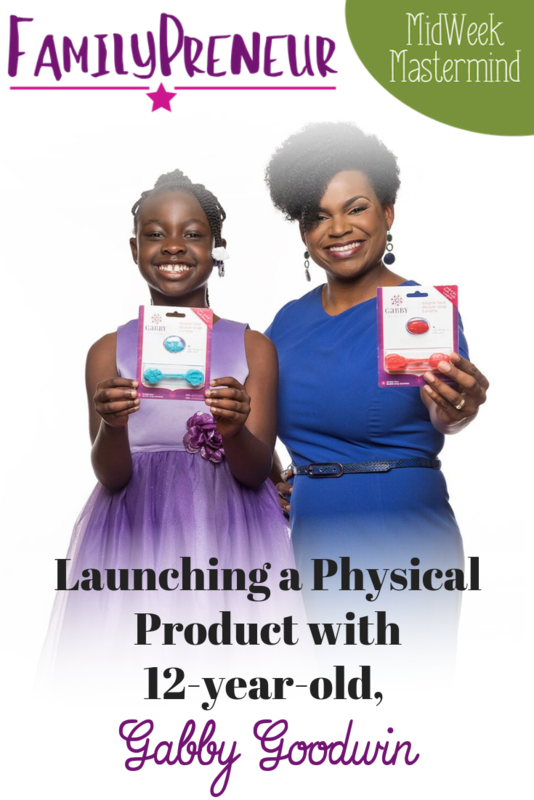 Gabby shares her advice for other aspiring KidPreneurs. Believe in yourself so you can achieve whatever dreams you have! She lives by the the quote: “A no is just an abbreviation for the next opportunity”. Gabby talks about her future plans for expanding the business. The primary way they expanding GaBBY Bows is through micro-franchising (business in a box). Team members receive product, vendor materials, t-shirts, name badges, mentoring, training, and affiliate links. They plan to expand with additional natural hair care products as well. Rozalynn shares her advice for other parents who want to support their KidPreneurs. Take the pressure off of yourself to “balance” everything and work on “blending” family and business and you’ll end up so much more fulfilled. Set your priorities and outsource what’s not critical for you to be doing. Gabby Goodwin is CEO of GaBBY Bows. She and her mom Rozalynn solved the age-old problem of disappearing hair barrettes by inventing the first and patented Double-Face Double-Snap Barrette. Her company has filled orders to all 50 states in the U.S. and in ten countries. Gabby's story has been featured on The Real, The Harry Connick, Jr. Show, The Tom Joyner Morning Show and The Today Show, and in Kiplinger Magazine, The Washington Post, Chicago Tribune, U.S. Chamber of Commerce Free Enterprise Magazine, JET.com, Essence.com and Madamnoire. She was named a 2015 South Carolina Young Entrepreneur of the Year, the youngest to ever receive this award, and the 2018 Black Enterprise Teenpreneur of the Year.